The MST CFX-W Scale RTR Rock Crawler is a high performance scale truck designed to deliver incredible performance. With a steel gear, planetary type forward motor transmission, 4 link suspension and aluminum threaded body shocks, the CFX-W is a scale rig that can go anywhere the other guys can. 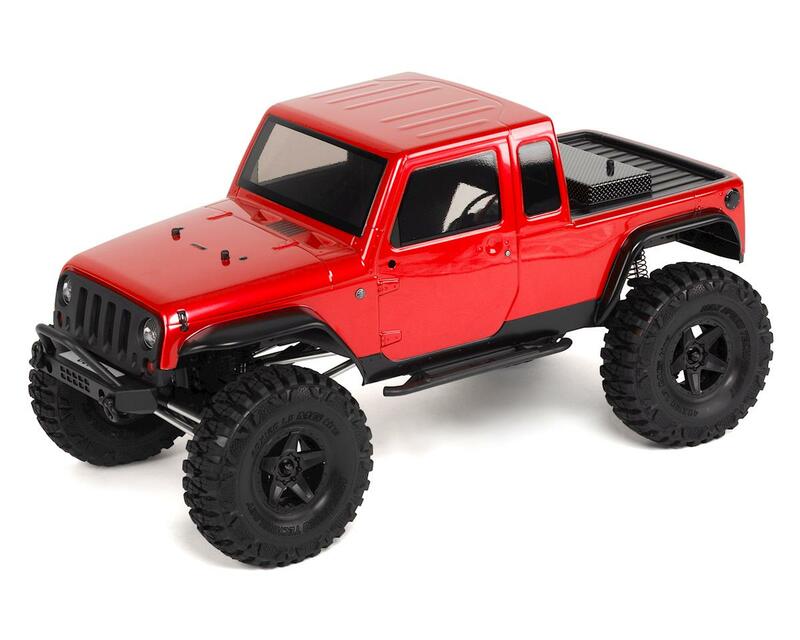 Plus, the included JP1 body offers the look of a custom build with included scale details that will impress the most demanding scale enthusiasts. The updated CVD drive shafts are beefier, and machined from high grade spring steel to offer a 2.7x increase in durability. This improvement allows the CFX-W to handle the stress from high power motors, without sacrificing steering angle or turning radius. MPA Portal Axle: The MPA portal axle design increases ground clearance and improves performance. The 4 gear design increases durability and helps to reduce torque twist through the chassis. TC80 Aluminum Shocks: The stroke-extended aluminum shocks increase articulation by 18% and offers smooth shock movement. The threaded aluminum cylinder with the spring retainer and dual-spring design, allows adjustment of vehicle height and preload. Planetary Gearbox & Dual Slipper Clutch: The planetary gear design provides efficient power transfer and high gear reduction ratio for stable power output. The dual slipper clutch design increases surface friction and provides a more precise holding power. The m0.6 pitch spur gear is suitable for high torque applications. All Metal Transmission Gear Set: The car is equipped with high-strength metal gears for strength and durability. 1.9" Wheels & Realistic Tires: The realistic 1.9” wheel is durable and looks good. The large tire size and rubber compound offers excellent performance and the large blocks tread design provides excellent bite. Aluminum 4-Link Suspension: The aluminum links offer durability and rigidity. The Four-link suspension provides optimal performance. Ball Bearings: Full ball bearings are included to help reduce rolling resistance and provide improved efficiency with longer run time. UPDATED Heavy Duty CVD Shaft: The updated CVD drive shafts are beefier, and machined from high grade spring steel to offer a 2.7x increase in durability. This improvement allows the CFX-W to handle the stress from high power motors, without sacrificing steering angle or turning radius. Steel C-Channel Frame: The realistic steel C-channel frame is durable. Hex machine screws are used throughout the kit to provide torsional stiffness, while at the same time making the truck easy to maintain and work on. Multiple shock mount positions allow adjustability to suit your terrain and driving style. Realistic Front Motor System:The front motor position adds to the realistic handling qualities of the model, and offers custom builders the space needed to add a custom interior or other modifications.